Well we are finally back in town and doing our thing, and by thing I mean chiefly, working and getting re-settled in our place. The work part is pretty simple but the settling is proving to be a little more challenging. Vancouver is quite different from pretty much all the places we visited, there was an initial adjustment period. What is mostly noticeable coming back to a place like Canada from pretty much anywhere else in the world is how efficient and well-run the country is. There are a lot of resources here per-person and you can feel it in everything you do. You can see why many people in other parts of the world are envious of Canadians and would love to come and check out some of the "goods and services" we enjoy here. Anyway, in the interests of interestingness, I'll continue to blog more photos of our trip just so that readers can get a little bit better idea of some of the places we went to and the things we did. Here's a pic of me hanging out with a little monkey named "Nyo-Nyo" which I thought meant "Nerd" in spanish, but he was anything but nerdy. I guess he was pretty domesticated as he had no problem climbing up onto my neck and making himself at home. 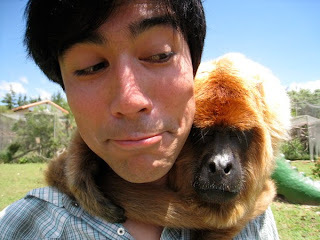 I had no ideas that monkeys were capable of being so affectionate. Usually they appear kind of intense and hostile to me, but this guy was a real buddies forever kind of guy. So basically what's going on here is that at the end of our trip we went to the bustling city of Santa Cruz Bolivia but only for a night. Santa Cruz is Bolivia's largest city and it's big and a bit hot and crazy, and we found it pretty comfortable for our last few nights. This toucan is the mascot for the hostel that we stayed at. 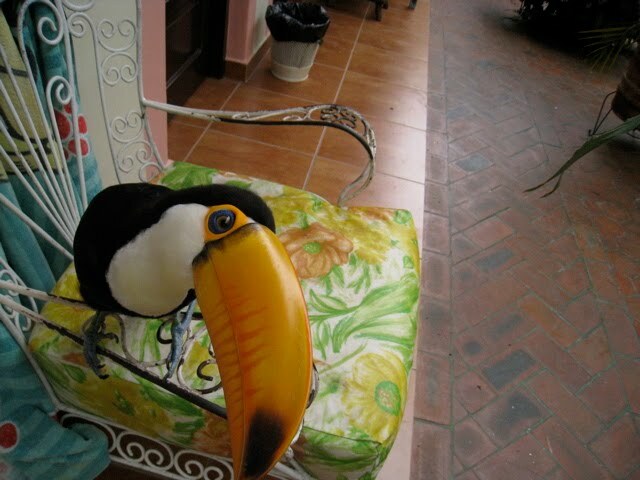 He was quite friendly and would nibble on your hand and jump around curiously looking at you. We visited this area in Bolivia towards the end of our trip that was fairly interesting and quite beautiful called Samaipata. It was a small town up in the mountains surrounded by spectacular natural scenery and countryside not to mention some cryptic ruins of international note. 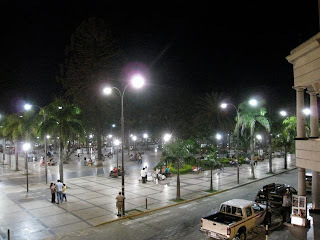 The main square down the mountains and in the jungly plateau of big city Santa Cruz is quite nice as you can see. There are dudes in white suits who walk around with roll-carts full of ice cream and other strolling treats. The square is immensely popular every night. People seem to always milling about taking in the air or socializing on hot nights. 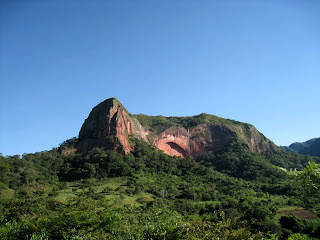 This old red rock is some kind of geographic highlight near to the area of Samaipata where tourist sometimes go to and do outdoor stuff. It's beautiful around here and while our guide book was touting and tempting us hither. We had a plane to catch. Next time - as they say.